What became of Crome & Goldschmidt ? In the time of my great-grandfather Horsens was dominated by the clothing industry. 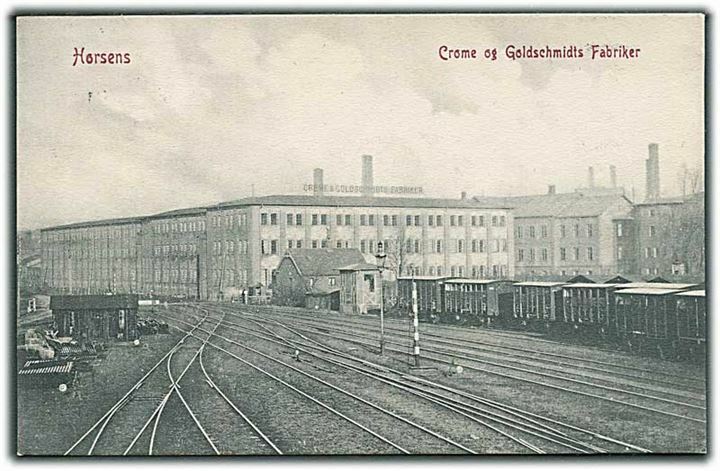 A well-known clothing store named Crome & Goldschmidt in Copenhagen had it plants here in Horsens. But increased global trade and the risk of Denmark joining what later became the European Union meant that Crome & Goldschmidt became a part of Illum. Not many years later the Crome & Goldschmidt name was phased out and today you can see Illum as the only name when you pass their shop in Copenhagen. I havn’t been there for many years as the shop really is a tourist trap with prices far out of reach for us ordinary Danes. For the citizens of Horsens it meant that unskilled workers from early age could get a job instead of hanging out in the streets. It is really what glocal economy has done for us. Created a new class of people not really needed in our society who can vote for the first guy who promises a change and a goodbye to the established politicians. It is only a question of time before such a guy comes to Denmark. There existed good times for unskilled workers here in Horsens back then.